We’ll depart from the harbor in Monterosso, the northernmost village, and cruise along the coast of the Cinque Terre, while enjoying an Italian aperitivo of salumi, cheese, focaccia and prosecco (Italian champagne). You'll get to know the other guests on the boat while learning about the history of the area, told to you by your English speaking guide. 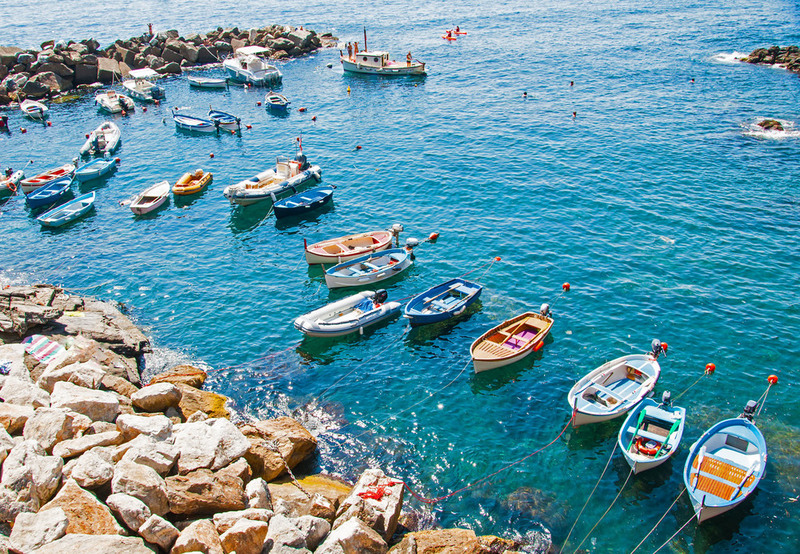 It takes roughly an hour to cruise down the coast to the southernmost village, Riomaggiore, and you'll see all five villages on the way. Our smaller boat allows us to get into little coves that bigger boats/ferries can’t access. Weather permitting, we’ll stop in one of these pristine coves for a swim in the crystal clear waters of the Mediterranean. Heading back north, we’ll stop in one of the towns for a seafood lunch at one of the area’s best family-run restaurants. Be prepared for a feast! After lunch, we’ll stop for another swim (weather permitting) before we head back to Monterosso.